It’s exceedingly rare to see any new waterfront development at Cultus Lake. 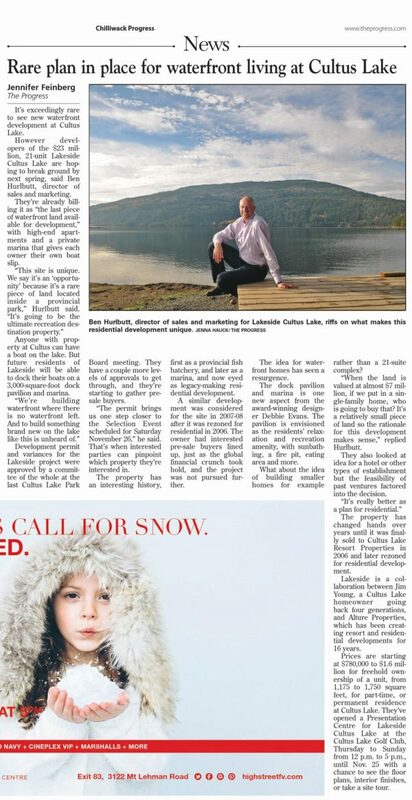 They’re hoping to break ground on the $23 million, 21-unit Lakeside Cultus Lake by next spring, said Ben Hurlbutt, director of sales and marketing. They’re already billing it as “the last piece of waterfront land available for development,” with high-end apartments and a private marina that gives each owner their own boat slip. Anyone with property at Cultus can have a boat on the lake. But future residents of Lakeside will be able to dock their boats on a 3000-square-foot dock pavilion and marina. Development permit and variances for the Lakeside project were approved by a committee of the whole of the FVRD Board . They have a couple more levels of approvals to get through, and they’re starting to gather pre-sale buyers. “The permit brings us one step closer to the Selection Event scheduled for Saturday November 26,” he said. That’s when interested parties can pinpoint which property they’re interested in. The property has an interesting history, first as a provincial fish hatchery, and later as a marina, and now eyed as legacy-making residential development. A similar development was considered for the site in 2007-08 after it was rezoned for residential in 2006. The owner had interested parties, but it was coming together just as the global financial crunch took hold, and the project did not proceed. But the idea for waterfront homes has seen a resurgence. The dock pavilion and marina is one new aspect from the award-winning designer Debbie Evans. The pavilion is envisioned as the residents’ relaxation and recreation amenity, with sunbathing, a fire pit, eating area and more. What about the idea of building smaller homes for example rather than a 21-suite complex? “When the land is valued at almost $7 million, if we put in a single-family home, who is going to buy that? 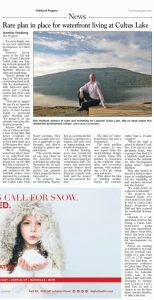 It’s a relatively small piece of land so the rationale for this development makes sense,” replied Hurlbutt. They also looked at idea for a hotel or other types of establishment but the feasibility of past ventures factored into the decision, and the math didn’t add up. The property has changed hands over years until it was finally sold to Cultus Lake Resort Properties in 2006 and later rezoned for residential development. 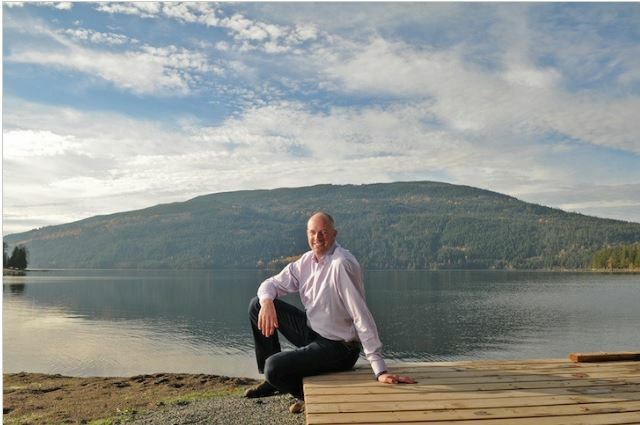 Lakeside is a collaboration between Jim Young, a Cultus Lake homeowner going back four generations, and Alture Properties, which has been creating resort and residential developments for 16 years. Prices are starting at $780,000 to $1.6 million for freehold ownership of a unit, from 1,175 to 1,750 square feet, for part-time, or permanent residence at Cultus Lake. They’ve opened a Presentation Centre for Lakeside Cultus Lake at the Cultus Lake Golf Club, Thursday to Sunday from 12 p.m. to 5 p.m., until Nov. 25 with a chance to see the floor plans, interior finishes, or take a site tour.